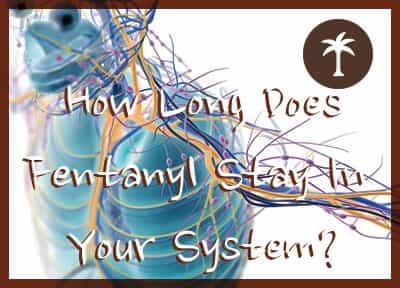 Resource center Fentanyl Abuse and Treatment How Long Does Fentanyl Stay in Your System? Fentanyl can be detected in urine for up to 3 days, in blood for up to 48 hours, and in hair for up to 3 months. Saliva tests are not reliable detectors of fentanyl. Why Is Fentanyl So Risky? How Can Drug Tests Detect Fentanyl? Ratain, M. and Plunkett, W. (2003). Principles of Pharmacokinetics. In Kufe D.W., Pollock R.E., Weichselbaum R.R., Holland-Frei Cancer Medicine, 6th edition. National Library of Medicine, DailyMed. (2011). FENTANYL TRANSDERMAL SYSTEM – fentanyl patch, extended release. Twycross, R., Prommer, E., Mihalyo, M., and Wilcock, A. (2012). Fentanyl (transmucosal). Journal of Pain and Symptom Management. 44(1), 131–149. Silverstein J.H., Rieders, M.F., McMullin, M., Schulman, S., Zahl, K. (1993). An analysis of the duration of fentanyl and its metabolites in urine and saliva. Anesthesia & Analgesia, 76(3), 618-21. Schwartz J.G., Garriott J.C., Somerset J.S., Igler E.J., Rodriguez R., Orr M.D. (1994). Measurements of fentanyl and sufentanil in blood and urine after surgical application. Implication in detection of abuse. American Journal of Forensic Medicine and Pathology, 15(3), 236-41.